Gold Cube announces a new location for its high-tech Cash for Gold terminal. The ATM will be available at Coral Square Mall. The company extends its network, ensuring that Floridians will obtain fair prices when selling or pawning precious metals. The international market for gold, platinum and silver is constantly in high demand. Their intrinsic value makes them highly desirable. In order to determine an item’s value, its gold, platinum or silver purity must be analyzed. Gold Cube has created a machine of the same name that promises to break the traditional way of trading precious metals. This state-of-the-art kiosk is fully-automated and uses the latest technology to analyze metals. The automated teller machine will help the customers sell or pawn jewelry in a safe environment, without being exposed to merchants who try to lower the price. The ATM accepts a wide variety of coin and jewelry, including necklaces, chains, pendants, bracelets, rings and wedding bands. Gold Cube uses a very user-friendly touchscreen interface. After scanning the ID card, the customers are allowed to place their precious metal items inside the machine. After the item has been analyzed and evaluated, a monetary value will be offered. The client can accept the offer or have the item returned. In order to provide a fair price, each terminal is connected to a server that constantly monitors the market pricing in the United States, Europe, and China. The automated Cash for Gold machine uses the latest Intel’s 3D XPoint Optane Memory technology to determine the purity and weight of precious metal. To ensure that each transaction is protected, the kiosk uses a combination of ID card scan, fingerprint scan, digital signature and email confirmation. In 2019, Gold Cube plans to accept cryptocurrency as a payment option. Customers will also have the ability to convert popular cryptocurrencies into cash at Gold Cube ATM locations. The Melbourne-based company was founded by brothers Nakia and Caleb Geller. Nakia has more than 17 years of experience as a startup entrepreneur, and Caleb has more than nine years of experience in gold buying. To overcome the difficulties associated with the old way of determining the gold items’ proper value, they came up with a solution: a machine that will fully automate the process. 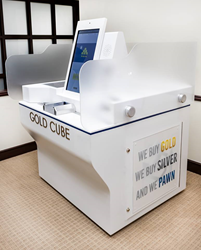 After many months of testing, the world’s first gold-trading kiosk, Gold Cube made its public debut in June 23rd, 2017 at the Merritt Square Mall in Merritt Island, FL. The company has recently announced the opening of one more location in Coral Square Mall. Coral Square is an enclosed, climate-controlled mall, situated at the intersection of W. Atlantic Boulevard and University Drive in Coral Springs, Florida. It is one of the best shopping places in the whole Miami metropolitan area. Clients are amazed by the wide variety of shops and restaurants.